the ability to manage company-owned devices running Android 6.0 (Marshmallow). That launch included several new settings, including device lockdowns, account management, sharing freedom, application management, and factory reset protection. Today, we’re going even further to make it easy to manage your company-owned Android devices. First, you can now bulk enroll your Android inventory and deploy it to remote offices with your chosen settings enforced. 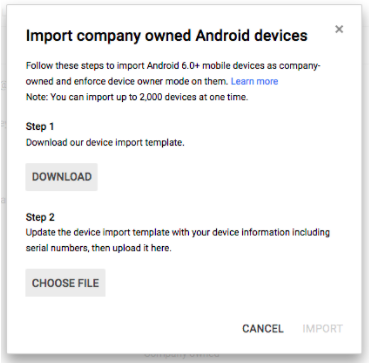 Moreover, during the bulk import process, you can now associate your company-owned devices with a new attribute called an asset tag to better integrate with internal tracking and billing tools. Second, the mobile inventory page in the Admin console (Device management > Mobile devices) now features improved filtering around device ownership and device actions, like blocking and wiping. Finally, all admin activities around the management of company-owned devices—like bulk import and device actions—are now logged in the Admin Audit section of the Admin console (Reports > Audit > Admin), while all end user activities on company-owned devices—like OS updates, setting changes, and app installs and removals—are now tracked in Mobile Audit (Reports > Audit > Mobile Devices). Most importantly, you can now choose to receive a monthly report to help you monitor company-owned devices that have been inactive in the last 30 days. Support for company-owned devices is provided to G Suite Business customers only. For more information, check out the Help Center. In October 2015, we introduced the ability to manage company-owned devices running Android 6.0 (Marshmallow). That launch included several new settings, including device lockdowns, account management, sharing freedom, application management, and factory reset protection. 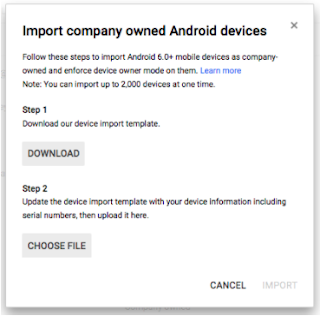 Today, we’re going even further to make it easy to manage your company-owned Android devices.